The price of BTC has hit its high and low within the last 24 hours due to what is called – a BitMEX “manipulation”. Bitcoin traded well most of yesterday above $6600 after leveraged crypto trading platform BitMEX announced that it would be halting trading for a scheduled maintenance. During that time, a short-squeeze manipulation took place which drove the price to a high of $7148 for Bitcoin. 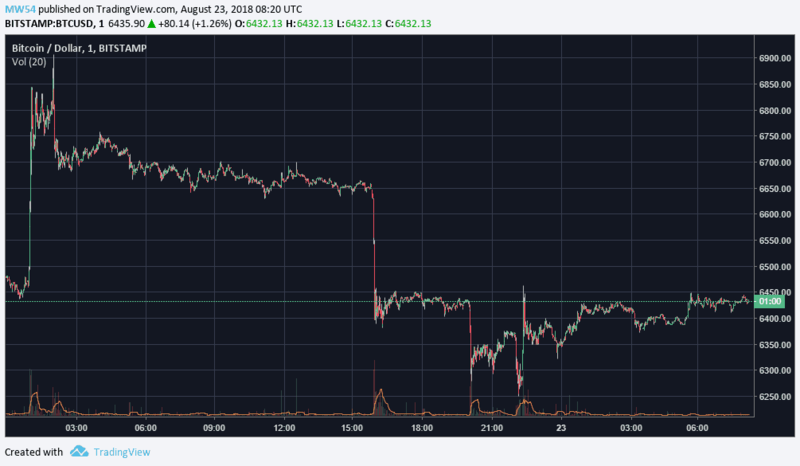 The manipulation has finally ended when Bitcoin returned to its previous day price area on the same day. Later yesterday, the SEC rejected another Bitcoin ETF, this time the ProShares. This was not surprising anyone, and besides a “formal” 100$ drop in the price, nothing has really changed. At press time, Bitcoin price stood at $6,447 while ETH traded at $274, a 4.64% decline from previous day price. Down from $0.85, Forkcoin (FORK) increased by 33.45% against the USD in the last 24 hours of trading. The FORK project has received very little attention since its launch November last year and the team has done very little to build the confidence of investors. At press time, FORK sells at $1.12 with a market cap of $5,410,045 and trading volume of $137,436 in just one exchange. Patron (PAT) emerged as a top gainer in the last 24 hours, with a 30.14% increase against the USD. The token recently passed screening to be listed on some top exchanges, including Hotbit, Extrates, Yobit, and two others. This could be a reason for the recent surge in value since the project is receiving a lot of attention. At press time, PAT trades at $0.016, with a market cap of $3,954,382 and a volume of $806,362. Signals Network (SGN) saw a 25.50% increase against the USD in the last trading day. The token performed well over the last seven days and the last 24 hours was just another one of its good days. With a current selling price of $0.007211, SGN market cap and trading volume increased to $631,961 and $130,902 respectively. Cryptaur (CPT) has lost over ten times its ICO price after a few months and more than 37% of its value against the USD in the last 24 hours. CPT currently trades at $0.001107 with a trading volume of $581,272. The post Market Watch August 23 appeared first on CryptoPotato. Next Next post: Are US Congressmen Hypocritical About Bitcoin?